Spring is a time for planting. And in this issue, I’ll share some tidbits on farm life in the 1920s I’ve learned during a recent video biography project. Storytellers open windows on the past. I love being a video biographer. First, I get the satisfaction that comes with helping individuals, families and organizations preserve, celebrate and share their stories on video. Second, there’s the great joy that comes in gaining new insights into ways of life that are long gone, but still live on in the memories of the storytellers I interview. Case in point: My current video biography project, a rather epic production, features a lady who began her life on a farm in 1920s Quebec, Canada. Her stories painted a vivid picture of a way of life completely foreign to me. 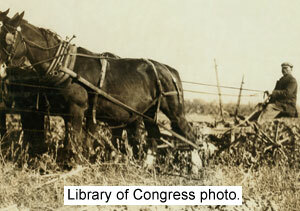 For example, horsepower literally applied to horses; there were no engine-powered rigs on this farm. All the work was done using muscle power supplied by men, or horses, or both. I also learned about something called a “stone boat.” The farmland was very rocky, and clearing the land of stones was a high priority. This was accomplished using a stone boat – a wooden sledge, about the length of a toboggan. Workers piled rocks onto the stone boat, which was pulled, of course, by a horse. Many of the rocks were used to build low walls that marked property boundaries. And how about growing root vegetables in the basement? This farm family actually grew carrots and parsnips, planted in neat rows, in the cellar. When they wanted veggies in the winter, all they had to do was go downstairs and dig them up. I find each and every video biography to be a learning experience. And I’m grateful to all the storytellers with whom I work with for opening wide the windows on their life experiences and letting enjoy the sights.